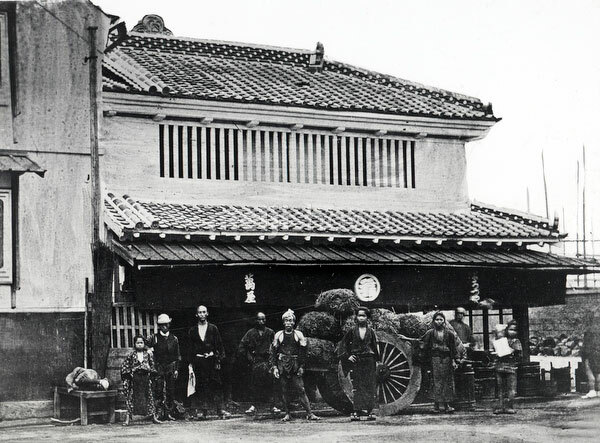 Several people stand around a daihachi cart (大八車) loaded with rice in front of a Dozozukuri (土蔵造り) style rice shop in Yokohama, Kanagawa Prefecture. On the noren (fabric divider hung across the entrance), the shop’s name is given as Yorozuya (萬屋). Part of the fire-proof warehouse (土蔵, dozo) can be seen on the left. According to the caption this shop was located on the main street, which is usually understood to be Honcho-dori. Very grainy image. I have also seen this image seen described as a charcoal shop. This photo is a detail of a photo published in The Far East magazine in 1871 (Meiji 4).